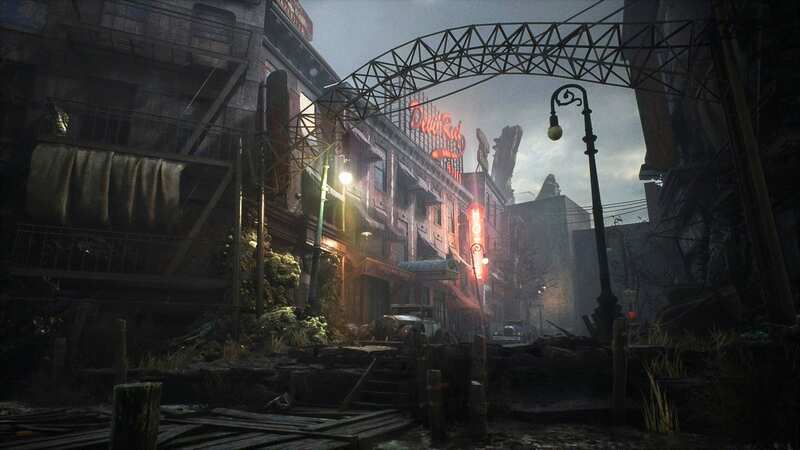 A new trailer titled “A Close Shave” for The Sinking City, which launches March 21, 2019, was released by Bigben Interactive and Frogwares. The trailer opens with a couple of faraway shots of a flooded and ruined city before zooming in on a beat-up hotel sign and then the interior of a hotel room. The protagonist, Charles W. Reed, is shaving in the run-down bathroom. As the camera zooms in on him, you can see how worn and stressed out he is. While he is shaving, tentacles start to protrude from his face and you can see the fear behind his eyes as he seemingly cuts them off. The tentacles drop into the sink dripping with blood, as he has flashbacks of past events, some from his days in the service and others of supernatural encounters. The flashbacks are of his encounters with some sort of alien beings, which abduct him and experiment on him. Nearly collapsing from the visions, holds on to the sink and regains his composure. When he looks up the tentacles are gone with no traces of them on his face. This gives us the impression that it was all in his head, but just as the trailer comes to a close, you see the remnants of the tentacles slither down the drain. Does Reed have an alien being residing in him or is his mind playing tricks? Check out the trailer for The Sinking City below and decide for yourself. The Sinking City launches early next year on PlayStation 4, Xbox One, and PC via Steam.